Well readers, it’s finished. C’est fini. Week 1 of culinary school. It began on Tuesday morning. I woke up well before my alarm and showed up to school way too early, and as I changed into my official chef’s whites in the locker room, I was grinning from ear to ear. How cool is this? I thought to myself. I have chef’s whites! I’m wearing chef’s whites! Hah! Eat your heart out, Bobby Flay. …It was then that I looked in the mirror and realized that, between the checkered pants, the white neckerchief and the white cotton cap, my “awesome!” chef’s whites made me look like a clown in a snow suit. Ah well. At least everyone else would be wearing the same thing. I marched upstairs to the level 1 kitchen and took my place at an empty station. I looked around the big, industrial kitchen filled with stainless steel pots and pans and countertops, sizing up my classmates and trying to resist the urge to burst into uncontrolled laughter from sheer nervousness and excitement. Just then, a round-bellied man in a tall chef’s toque and a thick french accent called everyone up to the instructor’s station at the front of the class to begin. And so we began, and I’ll tell you, it was a hell of a week. We met our chef instructors – Chef S., our lead chef, the round-bellied frenchman, and Chef W., our chef instructor, a tall, lean American. Chef W. began by warning us of the dangers of the kitchen, using words like “horribly disfigured for life” and “I don’t even want to think about it,” and Chef S. began teaching us the correct way to chop vegetables, explaining that you should never mix carrot trimmings with turnip or onion trimmings, (“no eefs, buts, or anytheeng,”) lest you want everything to turn into “a freakin’ zoo.” Noted. On Wednesday we met Chef T., who gave us a lesson on food safety and sanitation, mostly by regaling us with horror stories of food poisoning and industrial processing plant standards and national food-born epidemics. I learned all about viruses and parasites and bacteria, and about how I (and you, too, dear reader) have probably been exposed to more of these things than is nice to think about. I learned that it’s important to ask questions about where my food comes from and also to stay away from the street vendors who sell soft pretzels. On Thursday we tackled stocks, from chicken to veal to beef to fish and back again. In french: fond de volaille blanc, fond de veau brun, marmite, and fumet de poisson. We also got a nice treat when some students from the level 2 classroom brought by a dish for us to sample: a plate of mushrooms in mustard sauce. We all grabbed spoons and scooped up the mushrooms, chewing thoughfully and swallowing slowly to better appreciate the flavor. Not bad, we agreed. Thanks, level 2 students! Apparently it was offal day in the level 2 kitchen, and hazing day in level 1. Cool. I know that in roughly a month it will be our turn to initiate a new class of unassuming level 1 students on offal day, but for now I’d like to forget the offal (awful?) 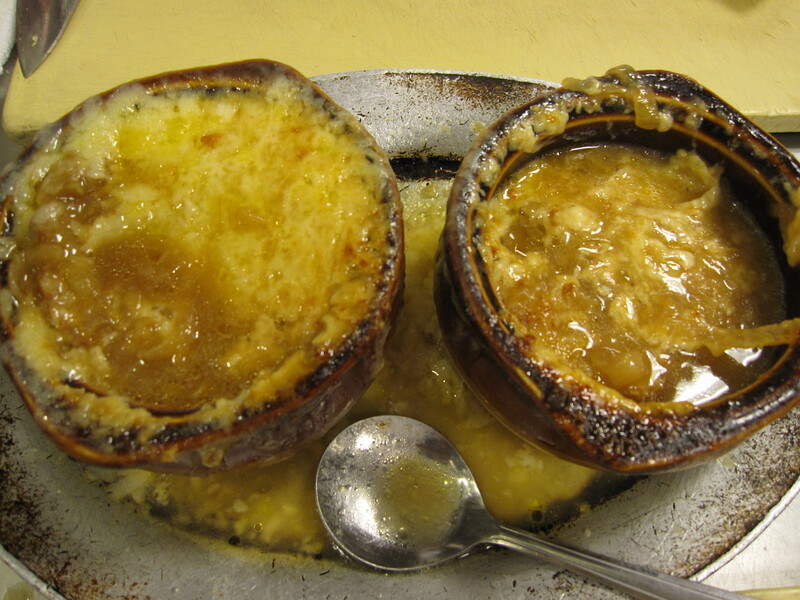 incident and tell you how to make french onion soup (gratinée à l’oignon). It goes down much smoother than kidneys, anyway. Place a large soup pot over medium heat. Melt the butter in the pot and add the onions, letting them cook and soften for 20-30 minutes. Once the onions are soft, increase the heat and continue to cook for 5-10 minutes, until the onions have caramelized and are a deep brown color. Season lightly with salt and toss the flour over the onions, stirring to combine. Add the garlic and cook for 2 minutes. Add the sherry or wine and let the mixture reduce for a few minutes. In the meantime, bring the stock to a simmer. Add the hot stock to the onion mixture, bringing to a simmer, and cook at a low simmer, covered, for 20 minutes. Season to taste with more salt and pepper. Preheat the broiler to 400º F.
Cut the baguette into slices, and place the slices at the bottom of a heat-proof serving bowl. Ladle hot soup over the bread slices, filling the bowl to the rim, and sprinkle a healthy layer of cheese on top of everything. Place the bowls on a sheet pan and place in the broiler for about 5 minutes, until the cheese is brown and bubbly. Serve immediately. So this new outfit of yours constitutes an improvement upon your usual sartorial sense, yes? All of this without nailpolish or jewelry? How do you bear it?